In Hollywood, the colon is often a deadly weapon. Two little dots that act like nails in the coffin of the American film industry. The reason? The colon often precedes a sequel, a spin-off, an adaptation or some other form of packaged unoriginality. Check your local theater listings. You’ll be hard-pressed to find a film uninhibited by the number two, a pre-existing brand, a title ripped from the best-seller shelf or the dreaded colon. This is a relatively new trend within the entertainment business. According to a study published in 2015 by Stephen Follows, a film data researcher, only 39 percent of top films released between 2005-2014 in America were truly original. Follows found in a 2018 study that sequels and prequels now make up nearly a third of all top-grossing films—a number that has doubled in the past 10 years. The hard truth is that originality is becoming a rapidly declining resource in Hollywood. Though, it must be said, this extinction is a systematic one. Unoriginal films have the benefit of being backed by a built-in audience. This makes every part of the filmmaking process easier. Suddenly, it is easier to get your foot in the door, to get funding, to attach big names and, most importantly, to sell tickets. Unfortunately, this streamlined route shirks off the one thing that could possibly revive the entertainment industry: originality. As a result, the most devastating casualty of this decline in original content is not the audience members, but perhaps the industry’s most unsung heroes–its writers. It’s no secret that Hollywood is a straight, white boys’ club. According to one study conducted by the University of Southern California Annenberg, Hollywood doesn’t merely have a diversity problem, but an all-out “inclusion crisis.” The presence of non-white, female or LGBT people is negligent, both in front of and behind the camera. This general disinterest in originality closes off the already narrow entryways that writers have into the business. This disproportionately affects writers who lack the whiteness, maleness or Ivy League degree that it takes to be taken seriously in their industry. The majority of these adaptations and sequels, by the virtue of their root in the past, are inherently exclusionary. Even spin-offs meant with the sole intention of inclusion often miss the mark. These well-meaning adaptations tend to do more harm than good. They often only create jobs for the already-established, thus silencing people who are still waiting for their break in an industry that places no value in their voices. 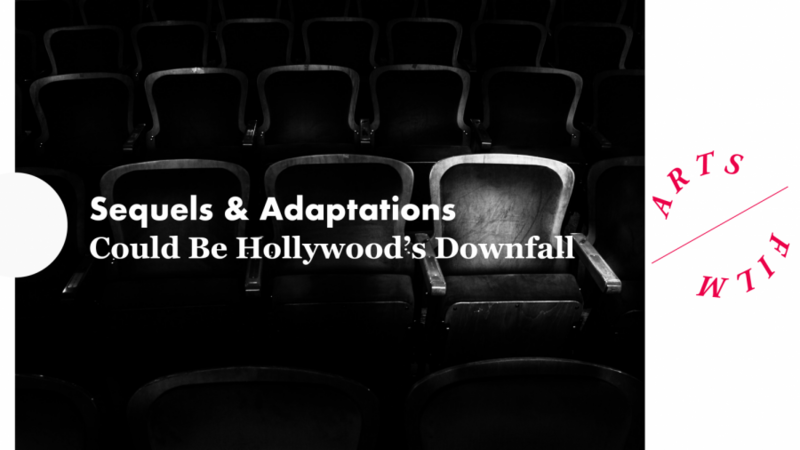 This is by no means to say that all sequels or adaptations are bad. “Back to the Future II” is still my all-time favorite film, to this day, despite all my pretentiousness. The “Grease” movie adaptation is, in every way, superior to the original stage musical. And no one can dispute that “Shrek 2” is the best one. That ending scene, when the Fairy Godmother sings “I Need a Hero”? Come on. At the same time, I have to admit—I am sick of the constant stream of cookie-cutter Marvel films, of ‘based on the best-seller by Nicholas Sparks’ title cards, or seeing colons flash behind my eyelids when I toss and turn at night. We need to acknowledge this dangerous trend toward unoriginality, especially as Hollywood attempts to move in the direction of social responsibility. This isn’t an issue that pertains only to movies and TV. It has been proven, time and time again, that what we see on-screen has a direct affect on our behavior. This dismissal of new voices is indicative of a dismissal toward the underrepresented. The American film industry needs to lead by example and take responsibility. The best way for non-industry members to effect change is to encourage and aid the production of original content and elevate the ideas of those who have been systematically ignored for so long. This means supporting original material when, by some miracle, it actually makes it to theaters. It also means demanding the presence of originality in filmmaking—social media has given us a more direct avenue to the industry than any other point in cinematic history. Film producers may not be public officials, but they do work for us. We, as audience members, have much more power than we give ourselves credit for. After all, originality does not have to go extinct in Hollywood without a proper fight.